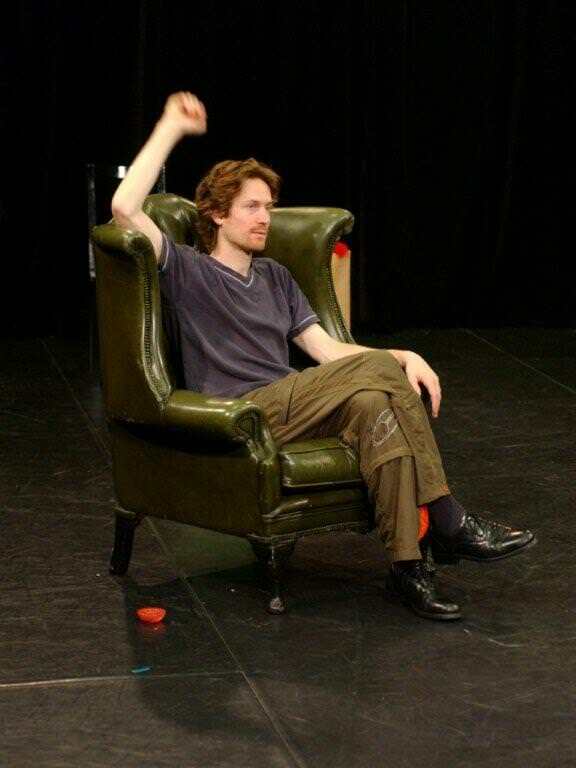 Dale Teater Kompani is founded in London by its artistic director Terje Tveit. The company’s production of A Doll’s House opens at the Rosemary Branch Theatre in Islington. 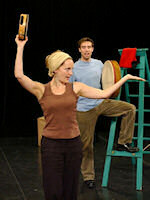 Cecilia Darker at the Rosemary Branch Theatre provides a rehearsal and work base for the company. On the strength of reviews and a positive reception, the company’s production of A Doll’s House is transferred to the New End Theatre in Hampstead with the financial	support of the Rosemary Branch Theatre. 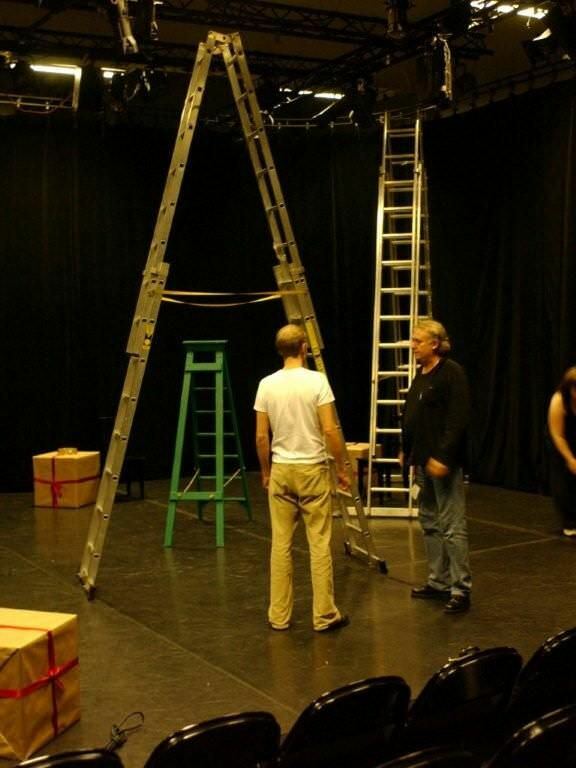 Later the same year the company’s production of Pillars of Society opens at the Rosemary Branch Theatre. The production receives critic’s choice in The Independent and is named ‘Five Best Plays’ nationwide. Dale Teater Kompani presents a Scandinavian season at the Rosemary Branch Theatre, which include Ibsen’s Little Eyolf, Strindberg’s The Stronger, Miss Julie and Axel & Bertha, an adaptation based	on Strindberg’s ‘Kamraterna’. Whereas the Strindberg productions are passing unnoticed, Little Eyolf receives considerable interest. Both the Times Literary Supplement and Timeout are overwhelming in their response complimenting the overall style and staging of Ibsen’s play. 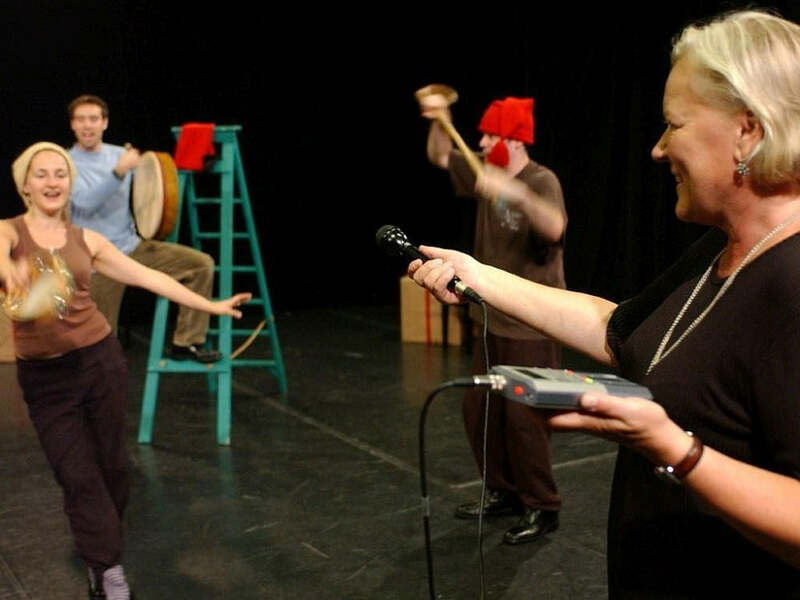 Moreover, the production catches the attention of the late Professor Inga-Stina Ewbank, who includes the company’s production in her paper Reading Ibsen’s Signs: Ambivalence on Page and Stage when addressing the world’s	leading Ibsen scholars at an Ibsen conference in New York the same year. The Norwegian National Theatre signals their interest in the company’s future work. 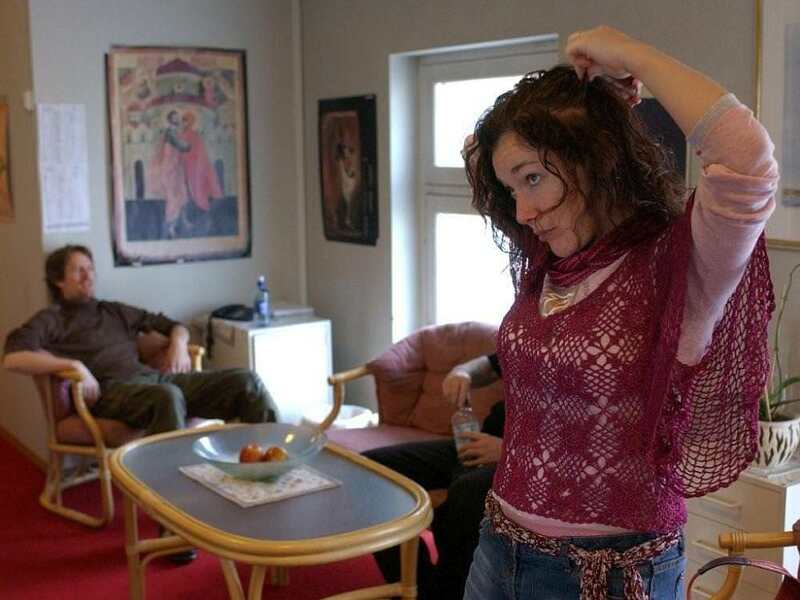 In the spring of 2003, Dale Teater Kompani is invited to the first talks preparing for Ibsen Year 2006, hosted by the Royal Norwegian Embassy. 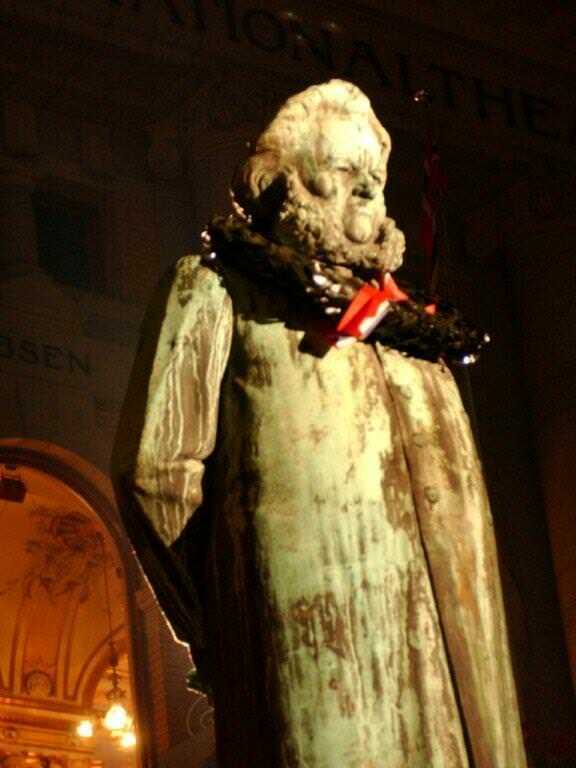 The embassy is advertising for outside ideas and initiatives to mark the Ibsen Year 2006 in the UK. In November Dale Teater Kompani’s production of Rosmersholm opens at the Rosemary Branch Theatre. 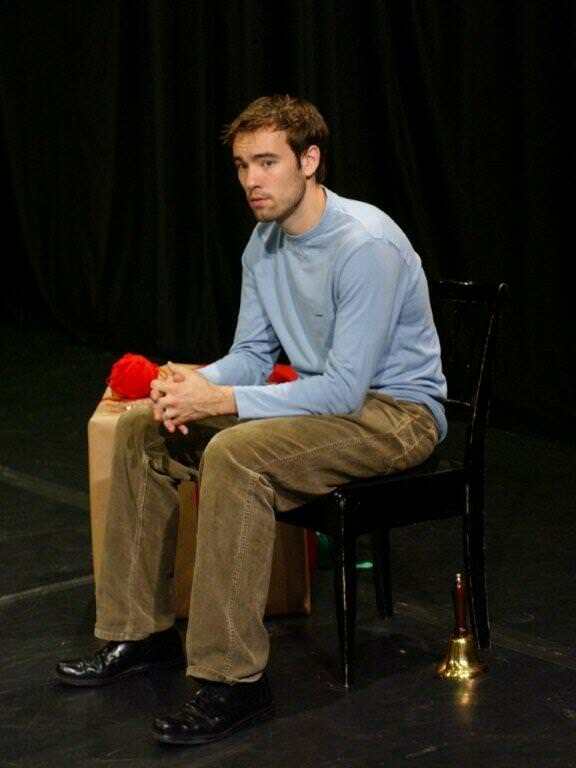 In early 2004 Dale Teater Kompani revives its production of A Doll’s House at the Rosemary Branch Theatre. The production receives rave reviews, and is seen by the artistic team from the Norwegian National Theatre. 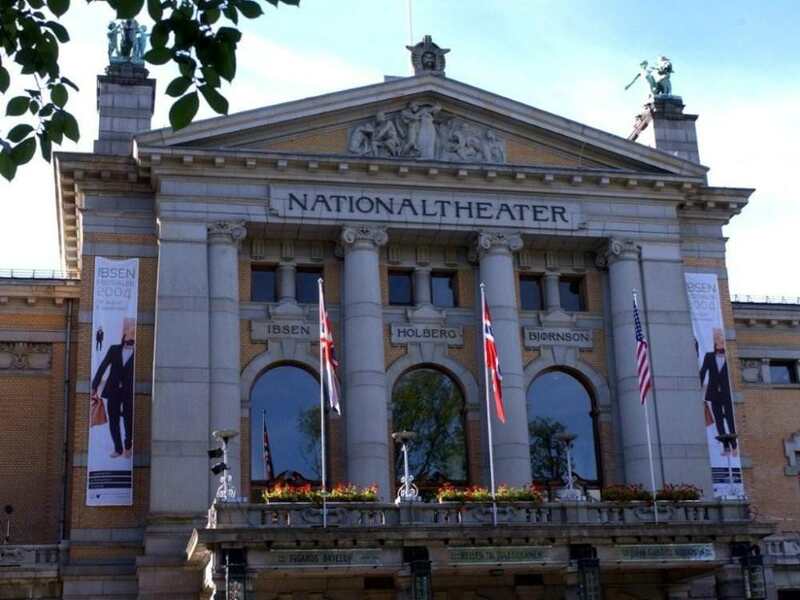 A Doll’s House is invited to perform at Nationaltheatret as part of the International Ibsen Festival 2004 in August/September the same year. Dale Teater Kompani is launching its plans for Ibsen Year 2006, which are to include the company’s production of Hedda Gabler at the Riverside Studios, an international Ibsen seminar in association with Marie Wells at the UCL, educational workshops in collaboration with Barbara Hawes at the British Library and also the development of the company’s own future project Six Women at Grand Café. The Almeida presets its seasonal programme, which is to include Hedda Gabler. Dale Teater Kompani decides to postpone its own Hedda-production and revive its previous production of Little Eyolf. Dale Teater Kompani meets representatives from the Norwegian Ibsen Committee in Oslo and presents the company’s plans for Ibsen Year 2006 in London. The Norwegian Foreign Office with the support of the Norwegian-British Chamber of Commerce secure Dale TK’s commitment to the Riverside Studios and the revival of Little Eyolf and an Ibsen seminar with both British and foreign speakers. In September, Dale Teater Kompani’s adaptation of Peer Gynt opens at the Rosemary Branch Theatre. The production is a workshop project, but draws more attention than expected. The production runs a joint promotion with the Royal Academy of Art’s exhibition Edvard Munch by Himself. The promotion includes performances and excerpts from the company’s production of Peer Gynt at the museum. 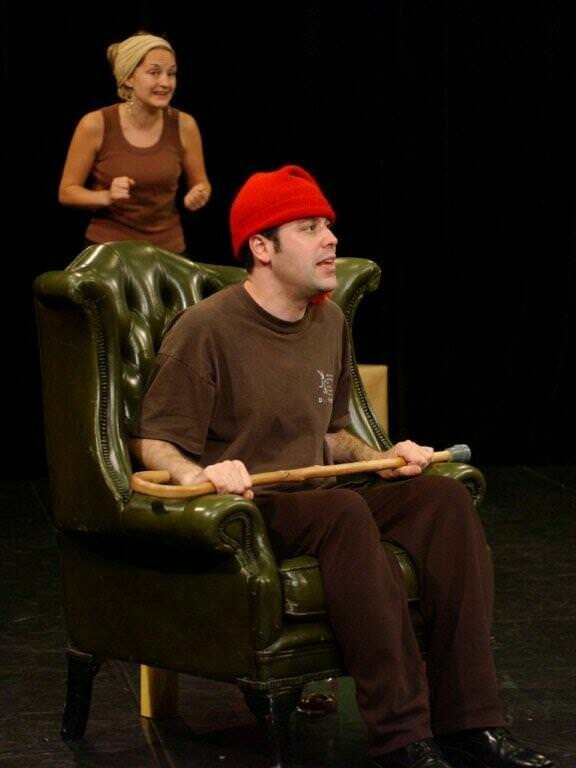 On the 17th of January 2006, Dale Teater Kompani’s production of Little Eyolf opens Ibsen Year 2006 at the Riverside Studios in London. Whilst he compliments the standard of work, Michael Billington in The Guardian calls for a more conventional and traditional staging of Ibsen’s drama. National critic, Timothy Ramsden, praises the production as exciting, innovative and insightful along with a handful of other critics including Professor Laura Caretti from the University of Siena. The production of Little Eyolf is complemented by weekly Ibsen talks given by two leading	Ibsen scholars, Professor Gunilla Anderman from the University of Surrey and Dr. Marie Wells from UCL. Dale Teater Kompani is also hosting an Ibsen seminar chaired by Dr. Marie Wells. Speakers include Professor Laura Caretti from the University of Siena, Italy; Professor Frode Helland and Førstemanuensis Anne-Marie Rekdal of University of Oslo, Norway; and Professor Janet Garton of University of East Anglia. The production of Little Eyolf is invited to guest perform at Teatret Vårt in Molde, Norway and is also performing as part of the Ibsen celebrations in Ålesund the same year. 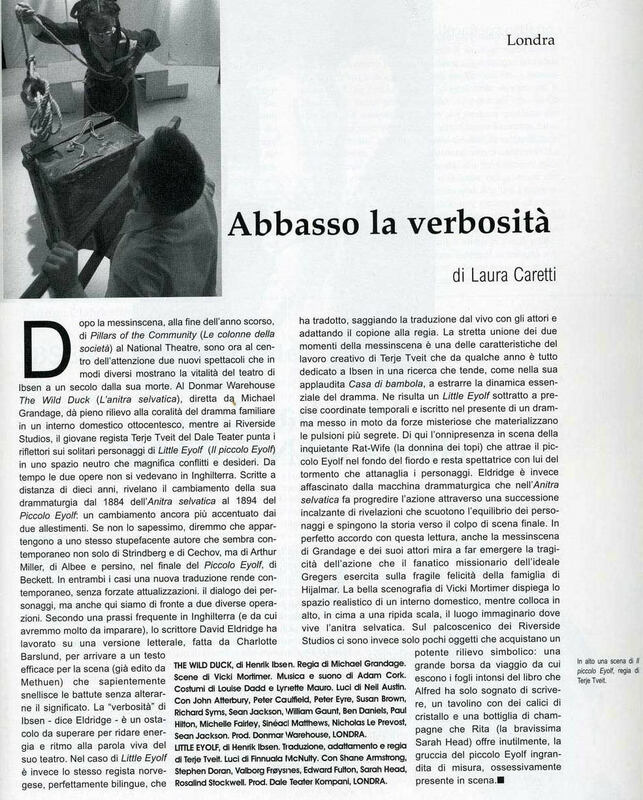 Professor Laura Caretti reviews Dale Teater	Kompani’s production of Little Eyolf in Hystrio, Italy’s leading theatre	publication. 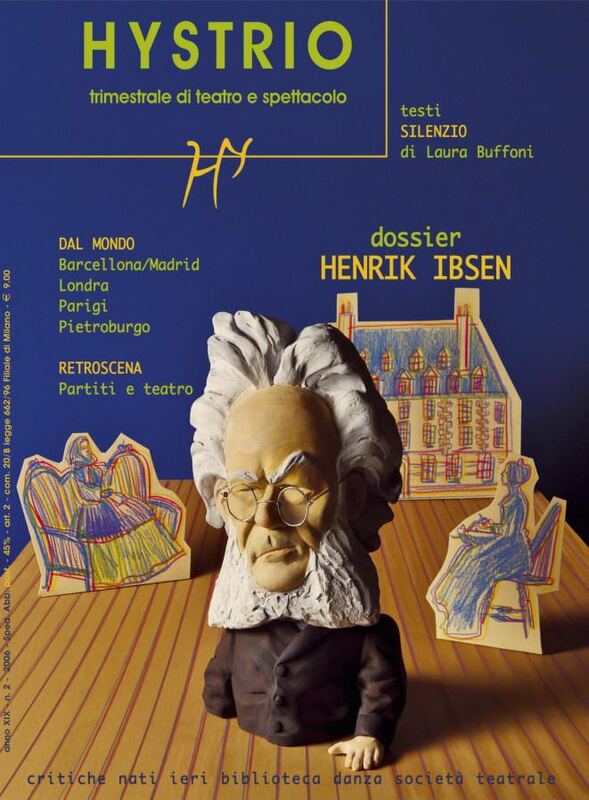 Dale Teater Kompani’s artistic director, Terje Tveit, is invited to speak at the 2006 Ibsen conference in Rome, ‘Three-Dimensional Ibsen’. He addresses the conference and presents his paper Ibsen and the Curse of the Corset. In February 2007, Dale Teater Kompani’s 2006 adaptation of Peer Gynt opens at the Hackney Empire Studio Theatre in London. The result does not meet the company’s artistic expectations and the production remains a workshop project for further development. The production is named Play of the Week in the London Lite. 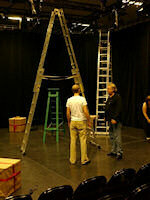 Ibsen Stage Company is launched on 24th of January. The event is hosted by Norwegian ambassador Bjarne Lindstrøm and his wife, Berit Lindstrøm, and takes place at the Royal Norwegian Ambassador’s residence in Kensington Green in the presence of Tancred and Ellinor Ibsen and more than 50 invited guests. A week later, Peer Gynt premieres at the Pleasance Theatre Islington, London. Set in the 1930s, both the original story and Ibsen’s character material is reworked and adapted. The production wins a huge audience and is sold-out during its three week run. The production is mostly ignored by the London critics, but receives considerable interest from abroad. 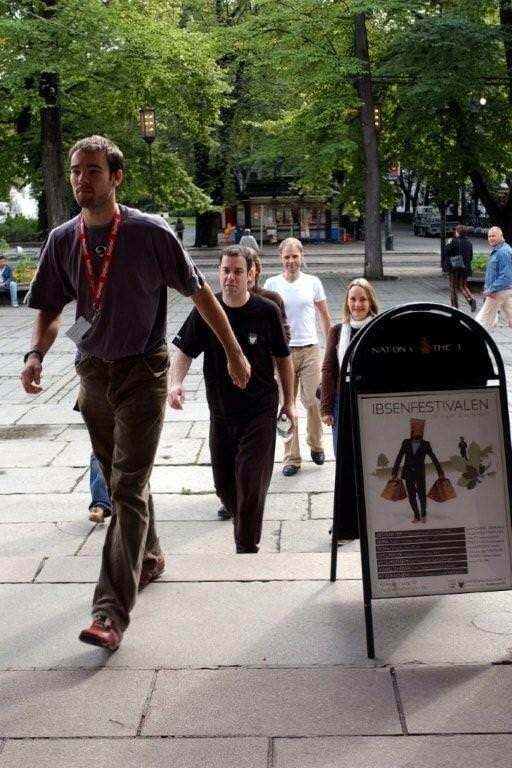 The production is short-listed for the International Ibsen Stage Festival 2008 at Nationaltheatret in Oslo. In November, the company returns to the Rosemary Branch with The Nightingale Mystery based on stories of Hans Christian Andersen. The production emerges from a draft developed five years earlier and paves the way for the company’s production of Hedda Gabler. 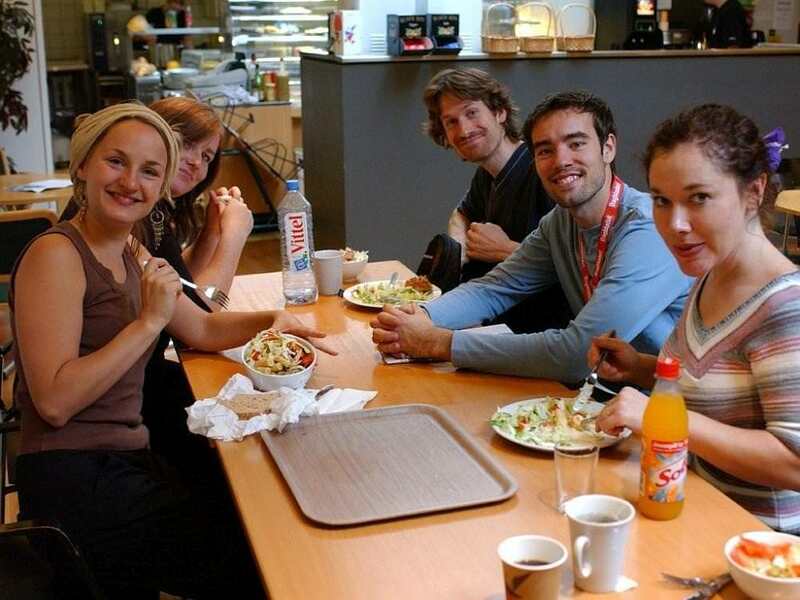 During the summer the company hosts two acting workshops: ‘Acting Ibsen’ introducing new actors to the company’s work. In October the same year the Royal Norwegian Embassy hosts a rehearsed reading of the company’s latest adapted version of Peer Gynt in the presence of Paul Binding. The reading is introduced by the Minister Councillor of Press, Information and Culture, Stein Iversen. The company starts preparing for its forthcoming production of Hedda Gabler. The company opens Hedda Gabler in the main theatre at Riverside Studios. The production reunites Sarah Head with the company whose Hedda follows	her previous work in A Doll’s House and Little Eyolf. 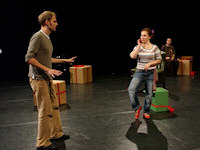 Despite the absence	of London’s critics, the production is an artistic success and receives interest from the	Norwegian National Theatre and the International Theatre Festival in Varna, Bulgaria. 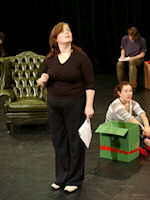 The production paves the way for a second Ibsen seminar at Riverside Studios: "Ibsen from Page to Stage". The seminar is hosted by Dr Marie Wells of UCL; an international panel of speakers includes Ba Clemetsen from the Norwegian National Theatre, Professor Laura Caretti from University of Siena, and author, critic and cultural historian, Paul Binding. 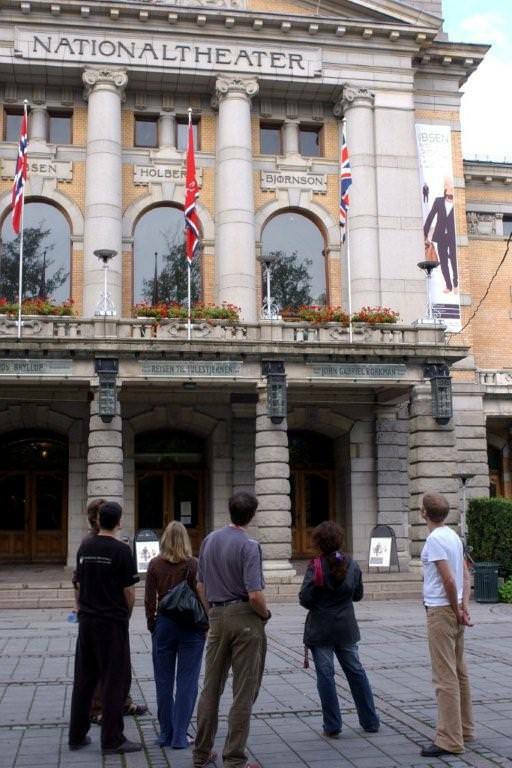 The company’s production of Hedda Gabler is shortlisted for the International Ibsen Stage Festival at the Norwegian National Theatre in Oslo. Terje Tveit begins collaborating with Norwegian composer Kaja Bjørntvedt on The Lady from the Sea. During the summer the company is hosting four open workshops for actors merging sound and text material developed from The Lady from the Sea. The company is hosting weekly workshops for eight weeks in preparation of Peer Gynt Recharged. The company is invited to develop and co-produce the project Prospero’s Children based on Shakespeare’s plays for Vestfold Festspillene 2012, Norway. Peer Gynt Recharged opens at Riverside Studios. The production receives a glowing review from critic, author and cultural historian Paul Binding and academic scholar Marie Wells. 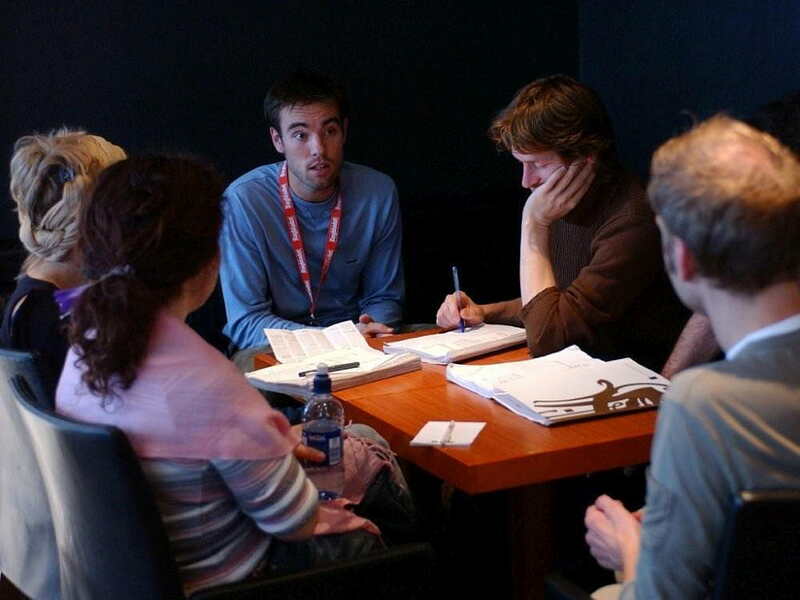 The Norwegian National Theatre attends the rehearsal process and the production is shortlisted for the Ibsen Stage Festival 2012 in Oslo. The production is rounded off with a panel discussion at Riverside Studios: Scandinavian gloom - or is there room for something new? Marie Wells, Paul Binding and critic for The Independent, Paul Taylor, exchange their views and analysis on the recent influx of Scandinavian culture in Britain. Peer Gynt Recharged is invited to open and guest-perform at the Delhi Ibsen Festival ‘12 in India. The company is hosting a summer workshop in preparation for Recording Hedda. The company prepares its programme for 2013-2014. The programme will include Peer Gynt Recharged, Recording Hedda, Tin Soldiers and the UK premiere of Bjørnstjerne Bjørnson’s Paul Lange and Tora Parsberg, introducing creative collaborations with music composer Kaja Bjorntvedt, multi-media designer, Momchil Alexiev, and academic scholar and translator, Dr Marie Wells of UCL. Recording receives financial support from the Norwegian Society of Composers (Musikkfondene). The company hosts several workshops on Hedda Gabler led by Kaja Bjørntvedt and Terje Tveit, exploring the dynamic between text and sound bringing the theatricality of Ibsen’s text to the fore. The company hosts its annual summer workshop, Ibsen form Page to Stage. The two-day workshop is led by RADA graduate in Text and Performance Ali Yalgin following his theatre Studies from Duke University in the US. In September the company premieres its modern adaptation of Hedda Gabler, Recording Hedda at New Diorama Theatre in London directed by Terje Tveit with music by Kaja Bjørntvedt. The project is a co-production between Ibsen Stage Company and New Diorama Theatre, in which Sarah Head and Matthew Rutherford return to the company. The production is shortlisted for the Ibsen Stage Festival 2014 at the Norwegian National Theatre and receives the attention of the Peter Brook Award committee. 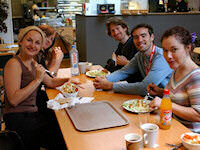 The production of Recording Hedda is complemented by two academic seminars. The first, Adapting Ibsen – Betrayal or Reinvention? is chaired by translator of Ibsen’s work for Penguin Classics Deborah Dawkin. Speakers include professor Laura Caretti of University of Siena, Ibsen scholar and translator Marie Wells of UCL, composer Kaja Bjørntvedt, artistic director Rebecca Manson Jones of Just Jones and artistic director of Ibsen Stage Company, Terje Tveit. The second, Disturbing Hedda – Connecting Conversations is led by psychoanalyst Phil Stokoe in conversation with Kaja Bjørntvedt and Terje Tveit discussing their collaboration and the psychological tapestry of Hedda Gabler’s flawed character. Artistic director Terje Tveit takes a sabbatical to pursue other projects outside the UK. The company’s projects remain in development seeking future funding and co-producers. The company starts developing its future project The International Tribunal for the Persection of Catilina through workshop in the UK, Scandinavia and on the Balkans.